Arcades Project is pleased to be featuring a collection of paintings by Paul Chambers, known for his provocative abstract conceptual landscape paintings related to his concern for lasting international peace. Recurring subjects include Advanced Russian Indian Ocean Initiative; Monday Human Sabbath; as well as a series of works containing a proposed solution, a road map, to peace in the Middle East, which can be seen on his website at www.dialecticalaestheticism.net. Referencing Toulouse-Lautrec, Larry Rivers and Tristan Tzara, Chambers explores the manner in which language can function like an object, or a color, where the way it appears on the page is not only as important as the content, it is the content. Reminiscent of a Dada experimentation with the poetic potential of typography which took the form of particular shapes and could only be grasped when viewed on a page, Chambers also explores how the concrete shape of the text can exist as a formal compositional element, with text, numbers, and symbols functioning as key contributors to the ‘gestalt effect’ of the image. Viewed within this context, the word does not attach to its meaning, but becomes a signifier of the time space continuum, like clouds shifting, as the idea comes in and out of the moment, in and out of view, in and out of life. 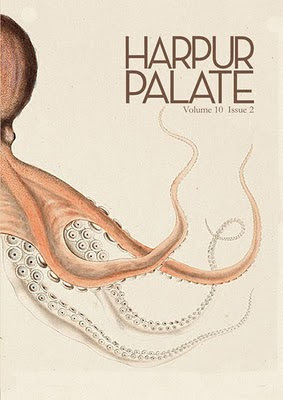 Harpur Palate is a noted literary journal that is published by graduate students at Binghamton University. “We are currently celebrating our tenth anniversary like madmen/women,” the editors proclaim, and this year’s theme issue, summer 2011, is Underground, as editors are seeking fiction, poetry, and nonfiction that “takes us into the subterrain. We want to see the underbelly of the world. We want to see its roots. Go gravedigging, diving, spelunking, into the subways and sewers.” Lee K. Abbott, Sherman Alexie, Marvin Bell, Norman Dubie, Denise Duhamel, T.J. Forrester, Alex Lemon, and Ruth Stone have all published in Harpur Palate, and the editors will be selling past and present copies of their journal on May 6 at Arcades Project. The Bird Film (ca1966) is an experimental B&W movie written and directed by Steve Poleskie, and filmed by Eddie Johnson, who is also credited as the producer. Johnson is the photographer who documented Elaine de Kooning when she painted her controversial portrait of President John F Kennedy just before he died. His series of photos appeared in LIFE magazine. The music for The Bird Film was done by John Herbert Mc Dowell, who, three years later, composed the music for The Wedding Party, Robert De Niro’s first film, also starring Jill Clayburgh and directed by Brian De Palma. Poleskie recently discovered an old 16mm print of his film, which he had almost forgotten about, and has had it made into a DVD which he will be showing at Arcades Project on Friday, May 6th from 5-9pm at 135 The Commons. 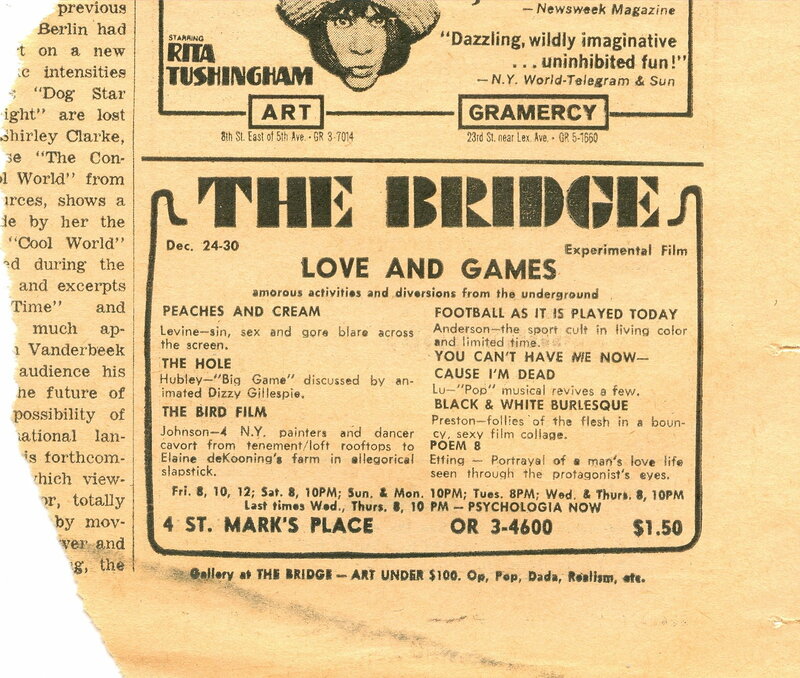 An advertisement for The Bird Film that ran in the Village Voice when it was first shown in NYC as part of an experimental film festival at The Bridge theater on St. Marks Place in Manhattan from December 24 to 30, 1966 describes the film as: “Four NY painters and a dancer cavort from tenement/loft rooftops to Elaine de Kooning’s farm in an allegorical slapstick.” Mrs. De Kooning (Willem de Kooning’s wife and a painter and art critic) is also credited as an executive producer. The film was shown numerous other times back in the 1960s, including at The Gate theater, where it opened for the cult classic Scorpio Rising and at the Yale Film Festival and on NPR. Poleskie also remembers showing it in Milan, Italy at Studio D’Ars in January of 1985. Poleskie reports that he has been out of touch with Eddie Johnson since 1977, when he returned to Albuquerque, NM and dropped out of the art world and became a house painter. He made no other films after the one they did together. Most of the other people involved with the film have also disappeared. The female lead, Deborah Lee, who had also appeared in Andy Warhol movies, jumped off the roof of her East Village apartment building and was tragically killed, shortly after the film was completed. The Bird Film itself is a black satire on “chase movies.” Filmed using high contrast reversal film to evoke the appearance in some scenes of early cinema, the movie has no dialogue and no plot. Actors, wearing masks and costumes, move back and forth between a real and an artificial landscape, created in a loft in downtown Manhattan, as the chase goes. Recently, A-Jump Books answered a few of Karen Brummund’s questions about their publishing company. A-Jump Books is based in Ithaca and has published numerous photography books. You can see and purchase books from A-Jump at the May 6th Arcades Project. K: What inspired you to start making artists books? AJ: We’ve both always loved the experience of encountering art through books, and find it’s an important component to who we are as artists and consumers of art. The medium of photography also lends itself very well to the book format. When we first started A-Jump, we felt there was a niche to be filled for inexpensive, yet quality photo-based artist’s books. With the exception of a few independent presses like J&L Books, you either had high-end, very expensive monographs, or zines generated on a photocopier, and not much in the middle. K: How did A-Jump Books get started? AJ: Very organically. That is, we never had any real ambitions to start a press. 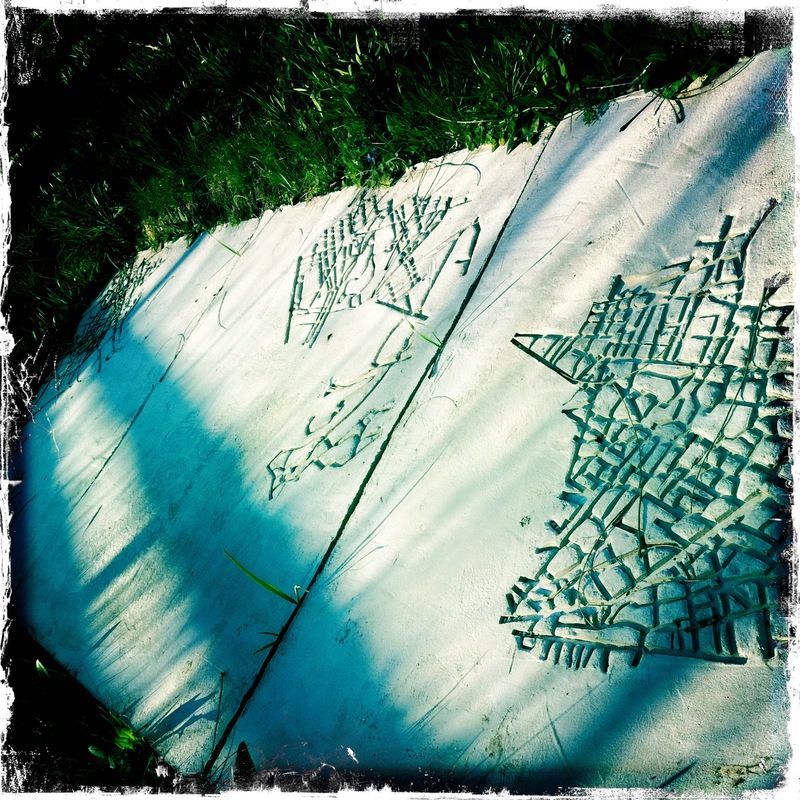 In 2005 Ron was working on a project called Alpine Star that ended up taking shape as an artist’s book. It felt very much like something that should be self-published, so we decided to simultaneously come up with an identity for this book, and any future artist’s books that either of us wanted to publish. Since then, we’ve slowly expanded the reach of our publishing efforts to include other artists whose work we admire and who have small projects that make sense as self-contained book works. K: Can you explain more about the differences between showing artwork in a gallery and in a book? AJ: Obviously, photographs can successfully find meaning and reach an audience in both gallery shows and books, but they’re very different beasts, with almost completely different problems and concerns. One practical reason we really love books, is that exhibitions have a very finite lifespan, whereas books, years after they’re published, can continue to find an audience. Also, certain bodies of work just seem to make more sense in book form. K: What is the most recent book you’ve published? 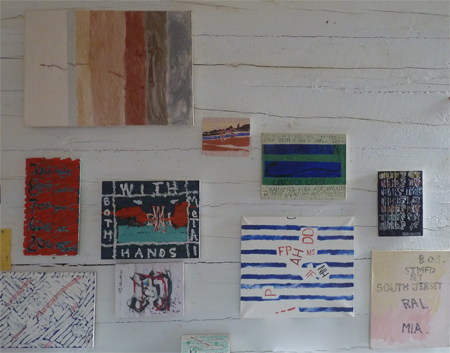 AJ: We published a short piece by New York-based artist Dan Torop last fall called Skydiving. We’ve been fans of Dan’s work since we first encountered it back in the late-90s, so it was very gratifying to be able to work with him on a project. This was the first piece that we published where we actually solicited the artist. We’re incredibly happy with the outcome of the book. It’s beautiful, tough, and smart – exactly the type of publication we’re trying to advocate through our press. AJ: Book publishing, whether it’s our own work, or facilitating the work of others, has been tremendously rewarding, and has broadened our understanding of how photographs can function. In short, we love photobooks! Local artist Werner Sun is a physics researcher at Cornell University who is perhaps best known in local art circles for his Calder-esque colorfield kinetic art mobiles. 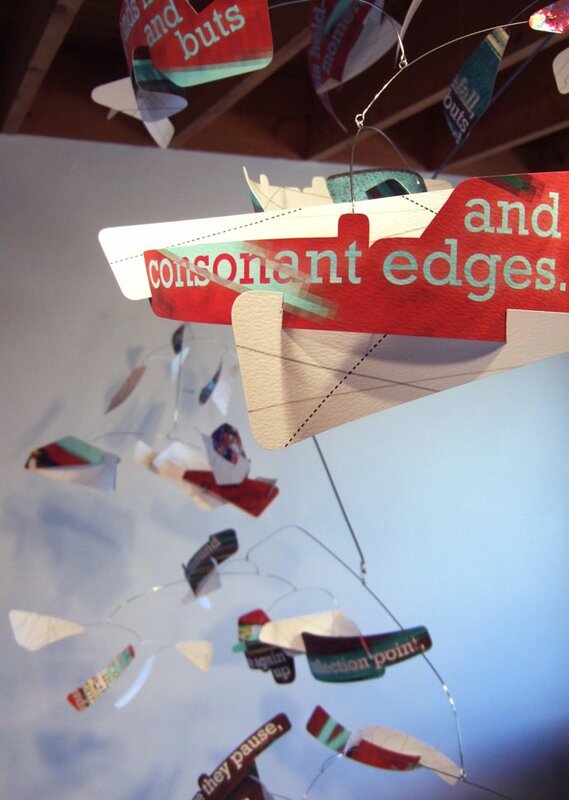 For this installment of Arcades Project, on Friday May 6th from 5 to 9 pm at 135 The Commons, Sun will create a ‘reading room’ installation that turns the traditional experience of reading a book literally upside down; a series of ‘poetry mobiles’ hang from the ceiling low enough that the viewer can read them like books, while a shower of words rains down from a cloud of text fragments. Well, spring has finally sprung, the snow has melted for good, and while we’ve had nothing but April showers so far, we’re happy – if not surprised – to see that Robert Andrade’s Ruined State(s) has somehow managed to survive the winter relatively unscathed. 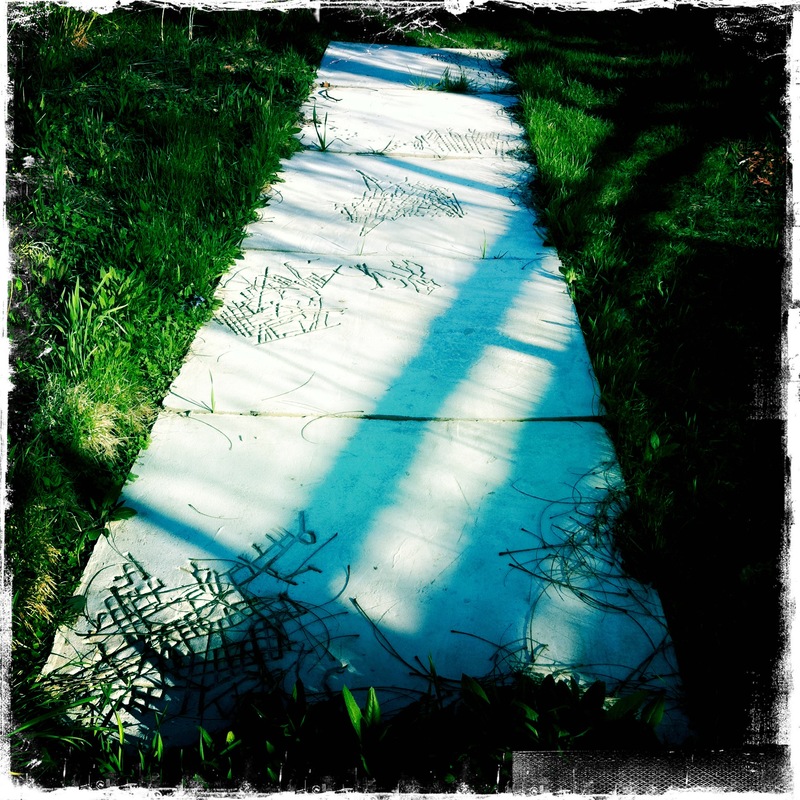 The piece, installed on the front lawn of station923, consists of five concrete segments (4ft x 4ft) impressed with fragments from a map of Rome’s civic pathways and pedestrian currents, aligned in the fashion of modern sidewalk slabs. The unreinforced concrete have been positioned half way into the ground and will remain exposed to time and the meteorological elements of Ithaca indefinitely, thereby documenting the inconspicuous frailty of form, history, power, and aesthetic criteria itself. Well, so much for the frailty. It seems we shall have to wait a bit longer to see this manifest. 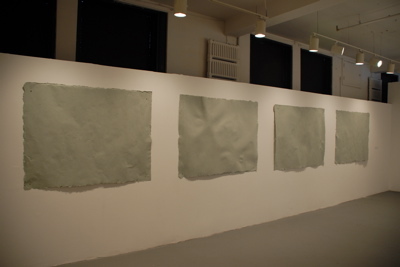 I was sorry not to make it up to see Robert’s MFA thesis show this week at the Hartell Gallery at Cornell, my schedule simply wouldn’t permit it. I’m sure it was great. I’ll admit to being a sucker for large scale minimalist/earth arty hybrid sculptural installations, and I’ve enjoyed seeing Robert’s work develop during his MFA stint here in Ithaca. Since he’s soon to finish his program and leave Ithaca later this spring, I look forward to watching his artistic career unfold from afar. 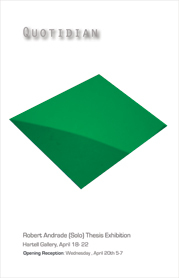 For those who missed the show, here’s a picture of Quotidian. 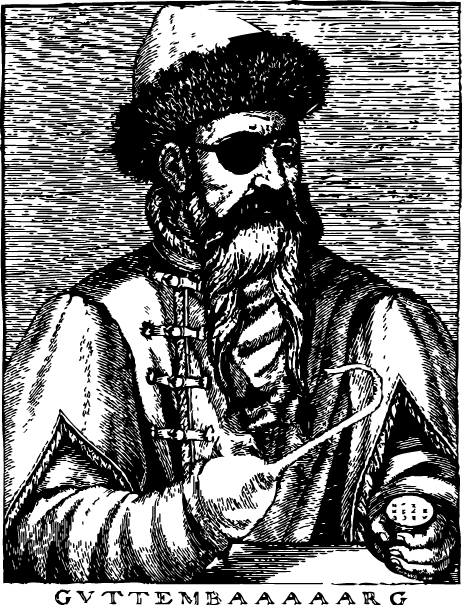 Thomas Gokey is bringing his DIY pirate printing press to Arcades Project. Come learn how to create beautiful hand-bound books from PDFs on aaaaarg.org. Gokey is a visual artist based in Syracuse who teaches at Syracuse University. He has an MFA from the Art Institute of Chicago and is currently a student at the European Graduate School. 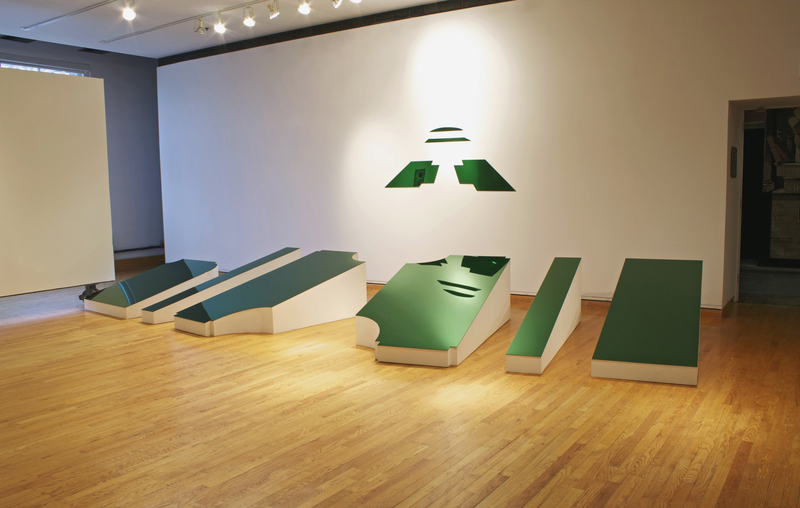 We first saw Gokey’s work at the Everson Biennial, where the curator selected three of his installations. Gokey’s piece $49,983 (pictured below) is literally this amount of money, the amount rendered in exchange for an MFA at the Art Institute of Chicago, pulped into four sheets of paper and for sale by the square inch. Gokey’s work takes all different forms and may sometimes appear more like a science project or paranormal research. Whether his art is in a gallery or on a wiki, you can expect a fresh perspective and provocative conversation on economics, capitalism, and education.